Ctsm. Black Knight x sib. Cymbidiella rhodochila x self @ $39. Psychopsis Mendenhall 'Hildos' FCC/AOS @ $39. Angraecum Mem. Mark Aldridge (sesquipedale x superbum) - In 4.25" pot - Good size plants. Phal. Joshua Irwin Ginsberg - In 4.25" pots. Nice miniature species from the Southeast Asia with many small, fragrant, white flowers that are borne in an umbel on a short flower spikes. In 6" wood hanging basket - Reg. @ $42. Fairly hard-to-find species from Central and South America with lightly fragrant dflowers. Shade loving and vigorous growing. Bushy, Mature Blooming Size plants. In 5" - Reg. @ $28. In 6" - Reg. @ $29 - $33. Hard to find FRAGRANT, summer blooming species from Borneo. Well-established, Mature Blooming Size plants. In 4" - 5" pots from $35. An amazing deciduous Dendrobium species from Vietnam with many small green, with almost black lip, long lasting flowers borne on a pendulous stem. VERY LIMITED QUANTITY. 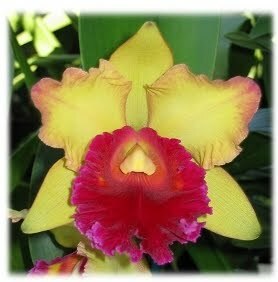 If you like unusual, yet showy orchids, this is your plant. Large, showy and very fragrant flowers. 4" plastic baskets - VERY NICE, large and bushy, Mature Blooming Size plants. Limited. Species from Central America known for its coconut-scented, reddish brown blossoms. In 4.25" pots - Reg. @ $14.